Two days, two guest bloggers! Today I welcome my five year old niece, Briar Rose*. Briar Rose: I like to play with my jewelry and my makeup box. What the box is is a makeup fake box with princesses on it. And it comes with fake makeup. What I do with my bracelets, I play with them and pack purses with them. That’s it. Next > Being Hit By A Truck vs. Infertility: which is the best? I will pass along the message 🙂 thanks for the comments today and yesterday. Both of them are so excited for the feedback. Right?? She’ll be so pleased with your comment, thank you! This guest blogger is a keeper! 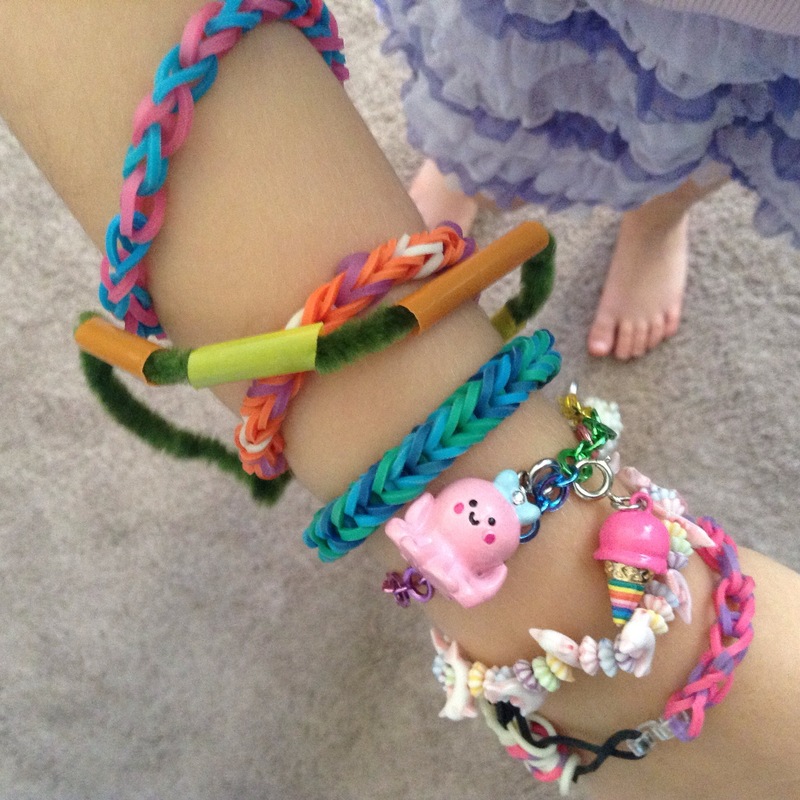 And I love her bracelets, I’d totally wear them. A girl can never have too many bracelets or too many purses! I totally agree! And what do we need purses for but to carry our bracelets? “makeup fake box” description is so cute oh my god. It kind of gives me a mini heart attack, it’s so cute. Through WP I’ve been reading about the Indian cultural relationship to bangles. It’s fascinating to me! I like the colors and symbolism. And the traditions of special occasions, like weddings. Aye aye 🙂 For example, in Marathi weddings you got to wear green glass ones. In Bengali weddings, white conch shell bangles and red (maybe coral) bangles are a must. The North Indians have set of white and red ones on their wedding known as Chooraa and they remove it only after a certain period of time. So interesting! I love that. Most of my bracelets have significance to me on a personal level, but I think that’s cool that you could be at the market, wearing your red and white bangles and people know you just were married. Sorry, I neglected to respond to your question. Post them on your blog! I’ll keep my eyes peeled.